Giant panda, endangered large mammal related to the bear family. It inhabits bamboo forests in China (mainly Sichuan). 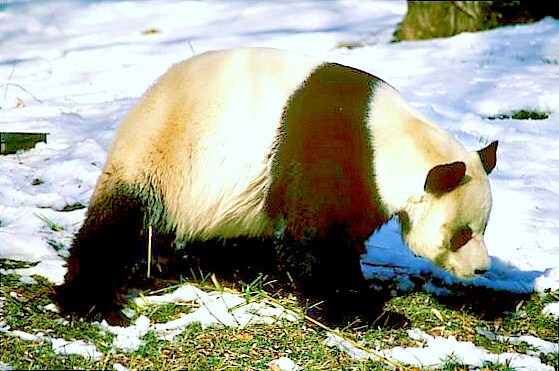 The giant panda has a short tail and a dense white coat with black fur on the shoulders, limbs, ears and around the eyes. Although classified as a carnivore it eats mainly plant material, particularly bamboo shoots. Length: 1.5m; weight: 150kg. Family Ursidae; species Ailuropoda melanoleuca.